InsuranceTrak Services is an independent insurance agency that works with multiple insurance carriers spanning across the entire country. While we do business across the country, we are centrally located in upstate New York at 4515 Culver Rd #206, Rochester, NY 14622. Of course, you can always call us at 585-282-0934, or email us at info@insurancetrak.com, if you can't stop into our office. Complete one FREE online application to compare multiple quotes. Fast response—typically less than 24 hours on weekdays for service. We are a nationwide insurance agency covering all 50 states. Expert, licensed insurance agents to guide you through the process and give you peace of mind. 1. Independent insurance agency: Being an independent gives us the flexibility to work with multiple insurance companies to find the best combination of price and coverage. Not all insurance companies are the same and you want confidence that your company will back you in the event of a serious claim. You can trust us as a top upstate NY insurance agency. 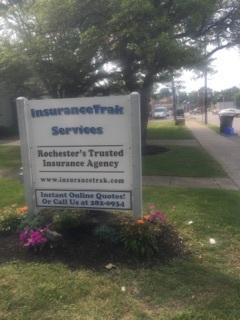 You can find our insurance agency consistently listed in local Rochester NY business directories. 2. Commercial Lines: InsuranceTrak helps to properly insure businesses of all shapes and sizes. Contractors, restaurants, retail, wholesale/distributors, manufacturing, medical, professional services, IT services, transportation, trucking, property owners and more. We provide many types of insurance like general liability, BOP insurance, commercial auto, NYS disability, E&O insurance, and even technology insurance. Commercial insurance is complex so we take the time to ensure you have limited gaps in coverage which prevents expensive lawsuits and gives you ultimate peace of mind. 3. TrakPay: Pay-as-you-go Workers Compensation Software For Everyone- Workers Comp (WC) premiums are normally based off estimated annual wages. Fortunately, TrakPay bases WC premiums on actual wages each pay period. Audits are now pain-free with minimal to no adjustments! 4. Personal Lines: Studies have shown that 70% of homes in America are underinsured by 30%. In the event of a serious loss, this could mean thousands of dollars out of pocket for a homeowner that their insurance policy won’t cover. Other big coverages that are often overlooked are ordinance or law coverage and sewer/drain water back-up coverage. 5. Not even auto insurance is a commodity! Insurance is complicated, but national auto insurance advertisers have led us to believe that purchasing a policy online without first considering complex coverage issues isn’t a concern. There are many factors that need to be considered on your auto insurance policy that are often overlooked including supplemental spousal liability and uninsured/underinsured motorist coverage. Your personal relationships, residents, financial situation, and other factors cannot be overlooked. 6. Instant online quotes from multiple carriers for home, auto, motocycle, renters, boat, RV, umbrella, ATV, snowmobile, jet ski, and condo insurance. If you’re interested in pursuing the quote, we’ll make sure you have all the available discounts, and your coverage is rock solid. No sales pressure! 7. Customer service: Enjoy one point of contact for all your servicing needs. Your service rep will maintain an intimate understanding of your personal needs. Currently a client? Visit our contact us page for service requests. We're constantly giving away free gifts! Check out our free tv giveaway page for information on our contests, how to apply, and the fine print. Thank you for visiting InsuranceTrak Services. Please contact us anytime and we can help with your unique insurance needs!